If we want to be women of impact, we need to live with our eyes wide open to God-opportunities. We need to get beyond our own agendas and move in the direction of HIS agenda. It is not about doing more of what you are already doing – it is about listening to the whispers of Jesus in the middle of the grocery store, or at the nail salon, or in your cubicle, in the next pew, in your living room, or classroom. Being a woman of impact is not about doing more each day, it’s about living to be led by Jesus with the days you are given. It all begins with a choice. If we want to be women of impact, we need to live with our eyes wide open to God-opportunities. We need to get beyond our own agendas and ask God what HIS agenda is. Let’s ask God to bless us and enlarge the borders of our influence for Him today! Consider the people in your life that you influence. Pray for fresh vision, courage, and opportunities to make an impact in their lives for Christ. GIVEAWAY: I want to impact YOU today, so I’m giving away 3 digital copies of the music soundtrack to my latest book, I WANT IT ALL. For a chance to win, CLICK HERE to visit my blog and leave a comment. Who do you want to impact? 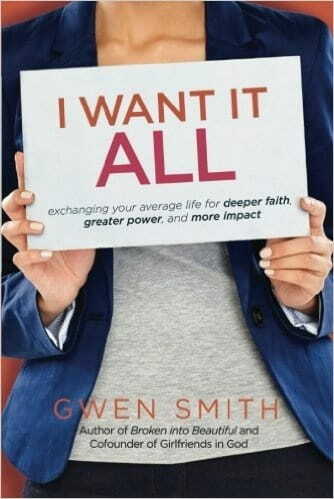 Today’s post is an excerpt from Gwen Smith’s book, I Want I ALL, which includes a Bible Study right in the back of the book; no extra purchase required. I WANT IT ALL is easy to read yet contains compelling and challenging content. You'll connect with the stories, probably dust off a few heart dreams, think bigger thoughts of God, laugh and smile a lot, search your soul, and even cry a little ... because each page lovingly directs you to the personal grace and truth of JESUS. (CLICK HERE to get a FREE Downloadable “7 Day I WANT IT ALL” Devotional Ebook.